These ears are perfect for creating either a cat or a mouse character depending on how you bend the ears. Each pair of ears features bendable wire for customs shaping of the ears and comes on a matching fur covered headband with attached chin strap for a secure fit. 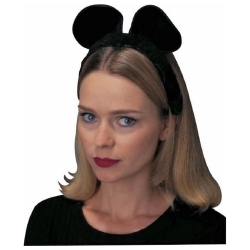 Don’t forget to check out the rest of our cat and mouse costume accessories. The cat/mouse ears are available in black, brown or white.